here for a big resolution. I think 20 francs were only for show-off, at the time I was in French countryside for 3 weeks and haven't seen a single one no matter how I tried. 20 Franc banknotes were common though. BTW, wasn't 20 francs really trimetallic, with core or the ring being Al-Ae and other simply brass Cu-Zn? Lazy to dig up now. 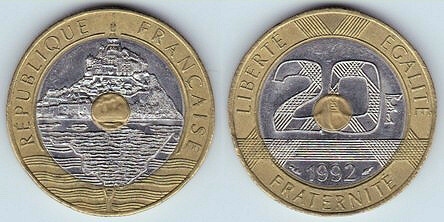 I think 20 francs were only for show-off, at the time I was in French countryside for 3 weeks and haven't seen a single one no matter how I tried. I had several in my change in the early 90's when on holiday - usually from filling stations for some reason. They are very like the 25 Kuna issues. Exactly! Those 25 kuna could be seen in late 90s (well, 6 issues to 2000. totalled 1,2M pieces) but later were probably taken away by collectors and "normal" people who found them interesting.